PHIL HAYES is a leader of the team, initiated by Tony Sale, that rebuilt the world’s first electronic programmable digital computers, the Bletchley Park “Colossus” machines. Phil’s work at The National Museum of Computing, next to Bletchley Park, is partly that of the computer scientist, and partly that of an archaeologist. This is because the Colossus was so secret that almost all the machines and their plans were destroyed after the war, on Churchill’s orders. His talk will illustrate the great challenges faced by the original Colossus builders, and those who reconstructed it in modern times. He will also show exactly how pioneering the original machines were, being electric computers able to made logical decisions far quicker than earlier machines based on mechanical relays and rotors. 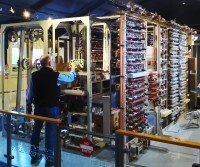 The rebuilt Colossus can be seen working at the National Museum of Computing, and Phil will be on hand throughout Saturday to answer any questions about this landmark in our modern digital world. Phil cannot attend our sessions on Sunday, because he is required to operate the Colossus at the National Museum of Computing for its many visitors on that day. A film commissioned by Google featuring Colossus veterans, and the rebuilding of the machine. Copyright Celebrating Bletchley Park © 2015. All Rights Reserved.